This tells you if students or staff are missing a check out time for a previous day's clock record. The alert uses the Clock > Failed Signouts. This tells you if Students have a Medical or Immunization Requirement coming up to be due within the next 30 days. This alert uses the Reports > Immunizations/Req Report. See Immunization / Medical Requirements. This tells you if Students have a Medical or Immunization Requirement that is now overdue. This alert uses the Reports > Immunizations/Req. Report. See Immunization / Medical Req's. Classes past their end date cannot be clocked into by students. 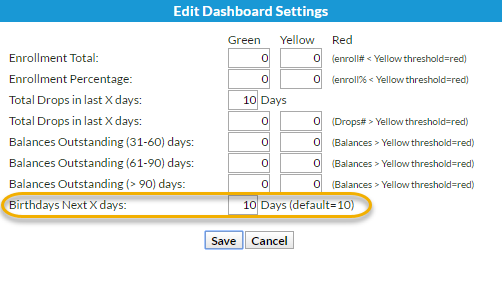 Copy the classes with or without enrollment into a new session, or extend the End Date to continue checking students into these classes.